When Yuki and co. go to check out the now burning Hemmingway shop, they discover that Ayumi is thankfully okay! A little bruised and a few bones broken, but at least still alive. He had managed to secure a rod before the store burned down, but is now too wounded to captain a ship. With rod in hand, Yuki, Haru, Natsuki, and Akira decide to embark into the treacherous ocean by themselves in order to catch JFX and end this madness once and for all. However, even before they can get the ship out to sea, the DUCK members surround them. Thanks in part to Tapioca and Akira, the four are able to escape. As there is only one fishing rod available, the task of fishing JFX out is left to Yuki, who is the “goddess’ companion” as told in legend. Once they are in the midst of JFX’s influence, Yuki attempts to fish JFX out while Haru puts up a shield of his own to prevent them from being mind-controlled. Although Yuki can sense the lure hitting something, the alien beneath the sea refuses to bite. 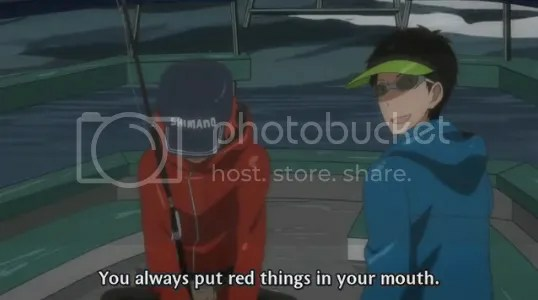 In this desperate moment, Yuki suddenly remembers something peculiar about Haru’s species: they love the color red. Quickly painting the lure red, Yuki again casts his rod into the sea, and is finally successful in getting a bite. I know this is supposed to be a serious scene and all, but whoah there Natsuki; you should watch what you say. That could easily be taken the wrong way. 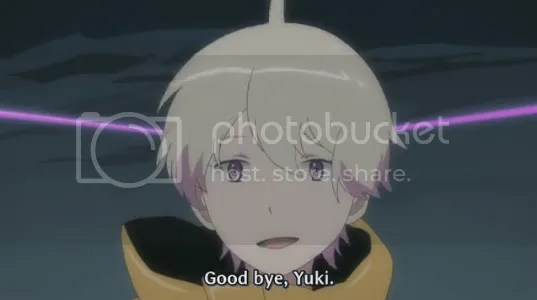 I knew this series (as depressing as it is now) was too “happy” a series to actually kill off a beloved side-character. Around this time, Akira (who had been steering the ship) gets a message from the DUCK organization’s boss. Missiles are set to be fired at their exact location once the typhoon hits. 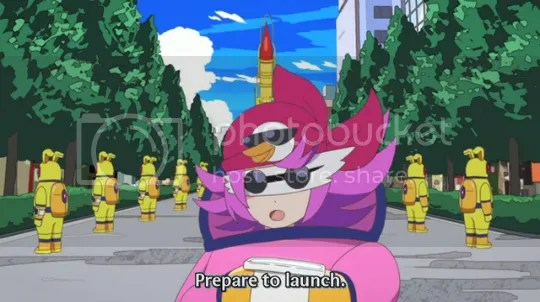 Because the DUCK organization’s ships in that area have already fallen under JFX’s control and are also loaded with missiles, it would be dangerous if JFX suddenly decided to unleash them. Akira is vehemently against this, and claims that he and his friends will resolve the situation without any casualties. Wish we could have seen more of the DUCK higher ups. Just when it seems as if there is a sliver of hope, the lure breaks. Haru, at his body’s limit, decides to make one final sacrifice in order to lure JFX away from Yuki and co. This is simultaneously the most inspiring and depressing episode of Tsuritama yet. The first half isn’t exactly all sunshine and rainbows, but it did raise a lot of good feelings. Ayumi’s alive! Our four main characters prove the strength of their friendship! Natsuki reconciles with his father! Annnnnd it’s quickly shattered by the end, ending the episode with one of the worst (to the fandom) cliffhangers in anime history. And, even despite all that, this was a great episode. 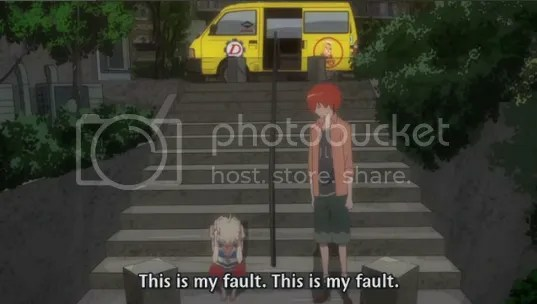 I think Tsuritama is one of the better paced series out there. As there’s only a dozen episodes to work with (it’s been confirmed that there’s actually 12 episodes of Tsuritama, not 11), the story-telling has to be really tight. There’s not much room to goof off with such a small number of episodes. Although the earlier episodes were a bit slower paced compared to all the action that’s been happening in the past few episodes, I don’t think there were ever any “filler” episodes. 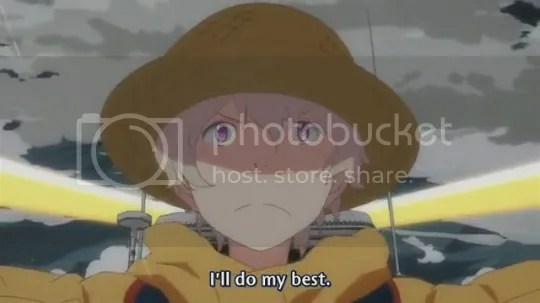 Every episode so far has mattered, whether it was to show off Yuki’s growth as a fisherman, or his growth as a character. I guess what I’m trying to say here is, even though this episode was very fast-paced, it still didn’t feel rushed. It was hectic, sure; but everything we’ve seen from past episodes have culminated into these final scenes, and it was beautifully done. 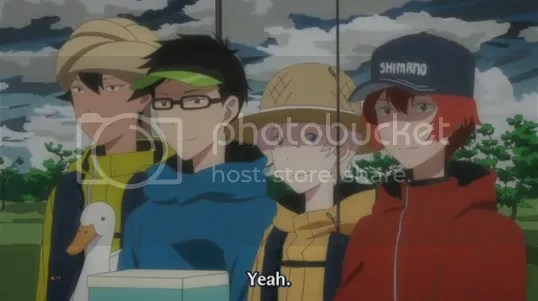 Well done, Tsuritama directors/writers! At this point, I’m wondering if I even need to talk about the animation anymore. The quality still seems to be about the same as other episodes, though I think we can forgive them for that since there was so much more action this time around. Overall, an excellent episode. Is there anything else that needs to be said?